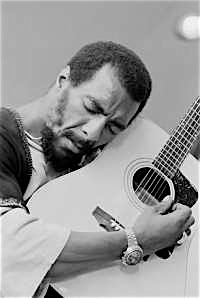 In the aftermath of the Boston bombing, the Texas fertilizer plant explosion and the Senate going belly up on passing gun control legislation, it seemed ironic that noted New York City folk singer Richie Havens, who was so closely associated with the idea of freedom, died Monday at the age of 72. Havens was one of those atmospheric guys, always around the scene providing ambiance, but on the fringe of stardom. It was his performance ability and talent that got him over, more so than his actual chart success. The man had a soul, a feeling for what was right in a moment, and an energy that transmitted through his music. Seeing Havens perform live brought him legions of fans. In fact it was one live performance in particular that made him. Havens was scheduled as the fifth performer on Aug. 15, 1969, the opening day of the Woodstock Music and Art Fair, but the crowd of over 500,000 had jammed the roads leading to Max Yasgur’s farm in Bethel, NY, causing massive traffic delays that left several artists unable to reach the venue. Havens was a life example of what can happen if a person is prepared and rises to an occasion when opportunity knocks. Woodstock’s promoters persuaded Havens to take the stage first and buy them some time until other performers could arrive. You have to think about how weighty that request must have seemed in the moment. Yes Havens was scheduled to play anyway, but nobody was exactly sure how many people were going to show at Woodstock. The sound system was only designed for 150,000 to 200,000 people. When the number far exceeded expectations, with more on the way, the logistical planning fell apart. Walking out as the first performer in front of 500,000 flower children had to feel a bit like you were being offered up as a Roman sacrifice. It was impossible to drive over to the performance stage, so Havens and his two band mates had to squeeze into a helicopter with their two guitars and two conga drums for the brief flight over. The three began their standard set shortly after 5:00 PM. Most of the artist playing Woodstock only got 30-minutes. Havens certainly would have fallen into that same time slot, but filled in for two hours, playing multiple encores to give the stranded artists more time. Havens was out of songs at this point. He deliberately took extra time tuning his guitar to stall for time and come up with something. It was on-the-spot that the word “freedom” came to mind. When he started strumming his guitar the word came out as FREE-dom, FREE-dom, with the emphasis on the front syllable and passion seething on the back. The word by itself became a song. This ballsy improvisation set the scene for the rest of Woodstock, and remains as one of its signature moments. For me, as a kid growing up in the 70s and 80s, Woodstock held mythical status. Most of the acts that played Woodstock were still in heavy radio play, but were either dead, past their best days of performing or had broken up. Unlike today, there really were no music festivals to attend in the 1980s. It was all arena rock, so the idea of getting to see Santana, the Grateful Dead, CCR, Janis Joplin, Sly and the Family Stone, The Who, Jefferson Airplane, Joe Cocker, Ten Years After, The Band, Johnny Winter, Paul Butterfield, CSN&Y and Jimi Hendrix at one event was insane. I used to daydream about hitchhiking up to those shows when I would catch Woodstock: 3 Days Of Peace & Music at the midnight movies back in high school. In retrospect it has become apparent that while the lineup at Woodstock was impressive, there were surprisingly few standout performances. Many sets were marred by rain, technical difficulties or disruptions. But Havens’ performance of Freedom endures. It quickly comes to mind whenever Woodstock is mentioned, and bookends nicely with Jimi Hendrix’s rendition of the Star Spangled Banner, another signature moment, played during his closing set at Woodstock early on a Sunday morning 43-years ago. May Richie rest easy. He made his mark and will forever be remembered as an ambassador of peace. This entry was posted in Music, News and tagged Freedom, Jimi Hendrix, Michael Lang, Richie Havens, Star Spangled Banner, Woodstock. Bookmark the permalink.